Landmark legislative session breathes new life into Oregon production industry. It was a bumpy, exhausting, arduous ride—but for those in the Oregon production industry, it was well worth it. On July 8—the final day of the 2013 legislative session—the House of Representatives passed House Bill 3367 to increase the state’s film incentive, known as the Oregon Production Investment Fund (OPIF), from $6 million a year to $10 million. This is $2 million less than what Governor John Kitzhaber, an ardent supporter of the bill, had been pushing for, but is still a major win for the local film industry. The journey wasn’t smooth sailing for HB 3367, which was comprised of several expiring tax credits, including the film incentive, the earned income tax credit, and the Oregon Cultural Trust tax credit, among others. Just six days prior to its passage, the bill appeared dead when Senate lawmakers failed to reach a “grand bargain” on increasing tax revenue and cutting pension costs, which would have helped fund the tax credits. But during a meeting of the Senate Finance and Revenue Committee a few days later, several local industry professionals spoke of the film incentive’s importance to the state, helping to change many committee members’ minds. The Senate amended the bill from $12 million to $10 million, and the bill was passed by a vote of 22 to 8. The following day, the last day of the legislative session, the House of Representatives concurred by a vote of 50 to 9. Since its inception, OPIF has attracted many productions to the state, such as Grimm, Leverage, Portlandia and ParaNorman, among others, but a higher incentive cap means more—and bigger—productions, which equals more jobs. And not only does the bill increase the annual cap of OPIF, but it expands the local filmmaker program (Indigenous Oregon Production Investment Fund, or iOPIF) to include “Media Production Service Companies,” such as post-production and video game development projects. It also lifts the threshold for out-of-state projects to $1 million of spend in Oregon. For iOPIF, the spending threshold will now be $75,000 on the low end, and up to the first $1 million of a project. The bill will become law on the 91st day following adjournment sine die (early October). Two other bills passed during the session will also positively impact the local industry. HB 2505 directs money to the Oregon Business Development Department, including a program called the Oregon Innovation Council. The Oregon Innovation Council provides funding for several initiatives, such as the Oregon Story Board (OSB), which is designed to grow and incubate the state’s digital media industry. Funding for OSB should begin later in the fall. Finally, the passage of SB 836 means that film, TV and theatrical professionals are no longer required to obtain a cosmetology license as it applies to working on productions. 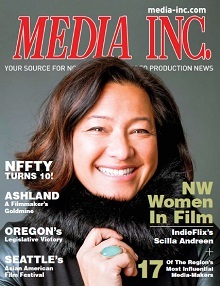 For more information, visit www.oregonfilm.org.